I heard some elders explain that they were accustomed to fasten these manuscripts along the length of the rooms of the lords for their aggrandizement and vanity, they took pride in displaying them in their councils." After the conquest of the Aztec Empire in 1521, a few learned Spaniards began to collect pictographic books and sent them back to Europe. 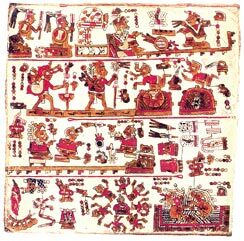 There are eight pre-Conquest style codices attributed to the Mixtec-speaking people of Oaxaca. They were made of animal hide and covered with a gesso-like foundation upon which figures were painted and then folded so that they could either be stored compactly or opened to reveal all of the pages on one side. 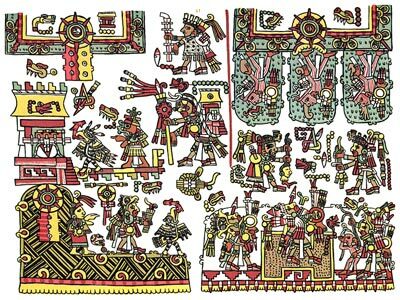 The fact that the Mixtecs painted scenes from codices on drinking goblets is a testament to the role the recitation of the sagas played at royal banquets. *Codices Colombino and Becker I are two parts of the same manuscript.